Hundreds Of Kerala Students Protest Against Harassment While Authorities Sleep! You know something is terribly wrong when in a certain corner of your Nation; the students of a National Institute have to conduct protests and rallies TO DEMAND women’s safety. And you know what makes it worse? It’s the ignorance of the rest of India (read- North Indian media) towards the plight of these students. Everyone in a society with law and order in place should feel safe and respected. It is not something we should have to beg for, it’s something that we deserve. But very sadly, the women of National Institute of fashion Technology, Kannur have been made to feel otherwise. 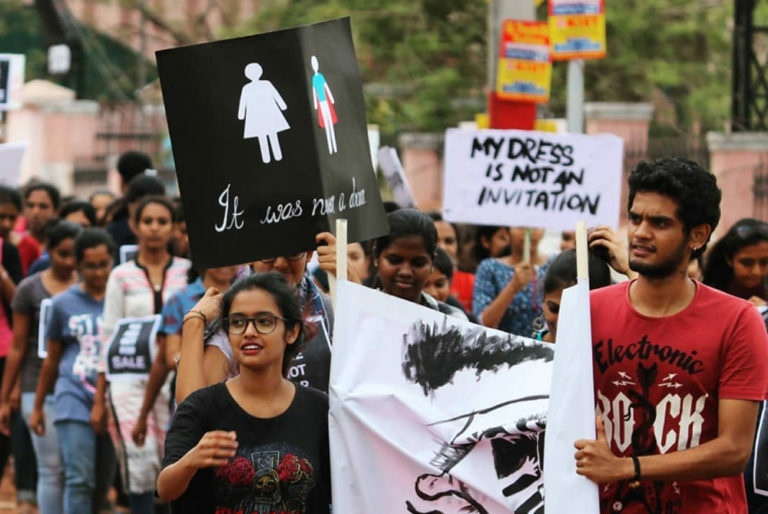 In past few months, a number of harassment, misbehavior, eve teasing, cat calling, and stalking cases have been reported in and around the campus of NIFT Kannur. As many as 8 cases were reported in March alone. But despite several complaints against such crimes, the authorities have not yet taken any concrete action. Around 600 students from all over the country study in the campus of NIFT Kannur. The students, especially girls have never felt so unsafe before. While students have been tolerating the obscene remarks and comments by certain faction of locals for quite a while, the physical violence and harassment has started only recently. There has also been Incidents of flashes on the hostel rooms and of clips being made of girls in the hostel bathrooms. Girls do not feel safe leavening campus without their male friends because of the excessive Eve teasing and misbehavior, and they also fear leaving college with their male friends because of unconstrained moral policing by the local people. So much so, the students live in a constant fear of getting beaten up by such perpetrators. Kannur, Kerela and the entire Nation needs to answer this simple question that- Is this, the kind of security students should now expect from a National Institute of India? The students, left helpless by the authorities and administration decided to deal with this menace by the means of dissent. An organized protest began with a rally on 14th March at 3.30 pm outside the campus of NIFT Kannur. Hundreds of students came out with placards and posters and shouted slogans to make their voice heard. The students organized street plays and small acts too as a part of this protest. Hashtag campaigns like #Ithastostop and #WeAreNotforSale trended on the social media with students writing how outraged they are due to the current scenario. They also collected letters from people to put in their complaints anonymously as a part of the protest, and more than 50 letters with complaints of misbehavior or harassment were collected in less than 5 hours of notice. Students of other colleges also participated in the protest to stand in solidarity with the students of NIFT Kannur. When we tried to get in touch with the victims and other girl students of the Institute, it was quite evident that they were afraid to come forward and give a statement because not only were they afraid of more such attacks but were also horribly shaken by the lack of support from the administration and the authorities. “Categorizing bold fashion oriented women as whores is just such a shame. “I’m a person who likes to travel alone. On one such day, while I was travelling in a bus, a man came and stood next to my seat. The bus was crowded so people were standing pretty close to each other. After some time, he moved even closer. I ignored this. Later I realized that he was trying to rub his private parts against my hand. I was shocked and terrified. I tried to move but it was not possible because of the crowd. He kept trying and had a smirk on his face. A lot of students think that the sick perception of the society that ‘the students of Fashion do not deserve respect’ is the root cause of this entire menace. It is important for people to educate themselves and understand that the students of Fashion are students too, and what they choose to wear and who they choose to hang out with is none of their business. A society that cannot respect and ensure safety of women is a society on the verge of collapsing. It’s really crucial that the entire Nation becomes aware of how problematic the situation is in a National institute of the country. And it is paramount, that we fix this. And we fix this, NOW.